Address: 6500, Baja - Szentistván Deák Ferenc utca 1. The chance to found a museum in Baja first occoured in 1914. Right before World War I Frigyes Déri had offered his valuable collection of cultural history and his library to the town of his childhood. He had planned to build a culture house, so he bought a site and gifted it to Baja. Baja was a very important port on the Danube. Her industry and commerce flourished this is why it was called Small Pest at the end of the 18th century. The rich town of commerce attracted the Jewish and at the beginning of the 19th century. 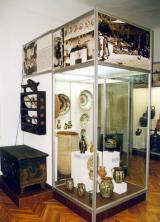 The exhibition in the Türr István Museum titled ‘Life on the Danube’ was first shown in 1984. Renewed, it is shown from 2001 under the same title. In the 18th century, the fights of liberation and the Rákóczi War of Independence lowered the population of the area which was slowly filled up with ethnic groups arriving from nearby countries. The voluntary emigration of earlier times changed. The manors and settling organized by the government took place. This way Germans, and later in 1945-1948 several hundred Székely and Hungarian families of Upper Hungary was settled around the area.